Around 70% of Americans will be treated for some type of shoulder injury in their lifetime. If we narrow the focus to competitive swimmers, the percentage skyrockets. Why, you ask? 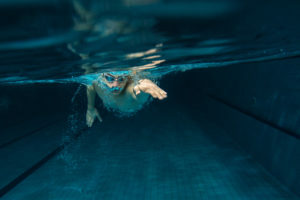 Well, the repetitive motion inherent in the act of swimming combined with the complicated junction of muscles and tendons surrounding the shoulder joint can be a recipe for disaster in those swimmers who don’t yet have perfect technique. A COMPLICATED JOINT: The shoulder joint is intertwined with many other muscles groups of the torso including the abdominals, upper and lower back, and pelvic muscles. When one of these adjacent muscles is not working in harmony with the others, the instability causes increased wear and tear on the shoulder joint. This can contribute to unnecessary fatigue and potentially cause injuries, like “Swimmers Shoulder”. Beginners and those who swim with poor technique are especially susceptible to such injuries. Injury prevention techniques can be a good way to ensure you can continue to have fun in the water without pain, but the best advice is to slow down and use good form to avoid future injuries. Joint Stabilization Exercise: For shoulder stabilization improvement, you can do a straight arm lift. Keep your arms out to your side as long as you can hold them. This will strengthen the muscles behind and between the shoulders. If you are a competitive swimmer or triathlete who is experiencing shoulder pain, we welcome you to stop in for a visit, even if only to get some tips on prevention and strengthening. As a former Division 1 collegiate swimmer, Brian Hartz specializes in treating and preventing swimming injuries. HARTZ PT offers an endless pool in its Lititz office which is ideal for stroke analysis and modification.